This manual contains procedures for the application of bioindication research using lichens for the assessment of environmental conditions. The focus is on methods of quantitative evaluation of lichen species in biological monitoring based on the use of poleotolerance classes and lichen bioindication indexes. The response of biological objects to pollutants is significant for investigations of environmental pollution caused by industrial means. A system of observations of the response of biological objects to the impact of pollutants is called biological monitoring. Biological monitoring includes observation, assessment and forecast of changes in the state of ecosystems and their elements caused by anthropogenic factors. 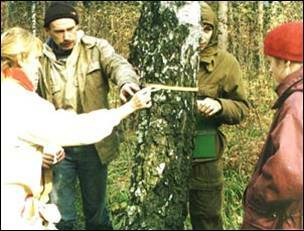 Lichens have been chosen as one of the main objects of global biological monitoring. Lichens represent a peculiar group of spore plants consisting of two components – a fungus and a single-celled or, rarely, filamentous algae, which live together and function as one organism. The fungus performs the functions of reproduction and feeding at the substratum, whereas the algae photosynthesize. Lichens are very sensitive to nature and composition of the substratum; their growth is dependent on microclimatic conditions and composition of air. Due to the extraordinary longevity of lichens, they can be used for dating the age of various objects over the range of several decades to thousands of years, based on measurements of their thallus. Lichens were chosen as an object of global monitoring due to the fact that they are widespread on earth and their response to external influence is very strong, whereas their own variability is small and extremely slow compared to other organisms. Epiphytic lichens (or epiphytes), i.e. lichens growing on bark of trees, are characterized with the most sensitivity among all ecological groups of lichens. Study of these species in large cities of the world revealed a number of general patterns: the more industrialized the city is, the fewer species of lichens are found; the less the total area of the tree trunk is covered with lichens, the lower the vitality of the lichens. It has been discovered that when the level of air pollution increases, first fruticose lichens disappear, then foliaceous lichens, and the last ones to disappear are crustose (cork-forming) forms of lichens. Composition of lichen flora in different areas of a city (in the center, in industrialized districts, in parks and in the outlying districts) turned out to vary so great that researchers began to use lichens as indicators of air pollution. A Swedish scientist, R.Sernander, conducted one of the first studies in this field in 1926. He pointed out a “lichen desert” in Stockholm (a center of the city and industrialized areas with high level of air pollution) where lichens were almost completely absent. He also noted a “competition zone” (districts of the city with average level of air pollution) where the number of lichens was poor, and a “normal zone” (outlying districts of the city) where many species of lichens were found. Recently it was shown that among all components of polluted air, sulfur dioxide (SO2) has the strongest negative influence on lichens. It was experimentally proven that a concentration of sulfur dioxide equal to 0.03 – 0.1 mg/m3 (30-100 microgram/cubic meter) had an impact on many species of lichens. At that concentration, brown spots appear in chloroplasts of alga cells and degradation of chlorophyll begins. A concentration of sulfur dioxide equal to 0.5mg/ cubic meter is harmful (even destructive) for all lichen species found in natural landscapes. There is a group of poleotolerant species (resistant to pollution), that can exist in rather polluted air. In addition to sulfur dioxide, other pollutants including nitrogen oxides (NO, NO2), carbon oxides (CO, CO2) and fluorine compounds also have an adverse effect on lichens. Moreover, microclimatic conditions in cities have changed greatly from their natural origins: cities are “drier” in cities, compared to natural landscapes (approximately 5% drier) and 1-3% warmer. Cities are also characterized by poorer natural illumination. With this information in mind, lichens serve as integral indicators of the state of the environment. The presence of Lichens in general indicates that abiotic factors are favorable for life. Most chemical compounds, having a negative impact on the flora of lichens, represent the main chemical elements and substances found in the emissions of most industrial objects. This information allows us to use lichens as indicators of the anthropogenic load. All the above-mentioned factors helped to determine the application of lichens and lichen bioindication in the system of global environmental monitoring. The present lesson is also based on attempts to use lichens as bioindicators of the state of environment. This lesson is aimed at assessment of spatial differences in air pollution based on the use of lichens. The following items will be required for the lesson: transparent overlay grid, measuring tapes with millimeter points (1 meter long) and a compass.